Comparisons are fun and often useful. Superhero movies are like westerns. Star Wars is like The Hidden Fortress. J.J. Abrams is like a vacuum. These kinds of parallels can enrich both works, revealing connections otherwise concealed. Dramatic function can crystallize when repeated in a different context. All works are connected in some way and we would be remiss to deny that. However, we must not mistake similar form for a similar function. Many audiences and critics have noticed the obvious similarities between Martin Scorsese’s Taxi Driver and Lynne Ramsay’s recent film You Were Never Really Here. It’s easy to see why. Taxi Driver stars Robert DeNiro as Travis Bickle, a vigilante loner, prowling the streets of New York City, who happens to meet a young girl ensnared in prostitution. Filled with vengeful rage, Travis violently and ruthless embarks on a quest to rescue this girl from her urban hell. 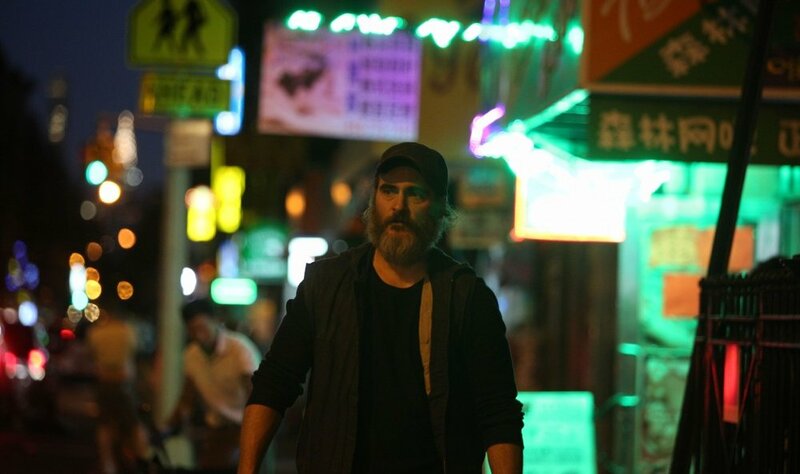 On the other hand, You Were Never Really Here stars Joaquin Phoenix as Joe, a vigilante loner, prowling the streets of New York City, who happens to meet a young girl ensnared in prostitution. Filled with vengeful rage, Joe violently and ruthless embarks on a quest to rescue this girl from her urban hell. These movies hit the same beats and basically have the same logline. They’re both isolating, rage-filled and masculine-focused. They’re even both about fundamentally the same thing – violence. And yet, why did I feel so different after watching each of them? And why do they look so distinct from each other? The reason, like Ebert said, is not what these movies are about but rather how they’re about them. And these movies are about violence. Scorsese uses violence to force us to examine our relationship with the violence itself. The movie is not really about Travis Bickle. That is why Scorsese keeps him at a distance. We are not in his head we are near it; observing it. He emphasizes our role as a viewer. We watch his isolation, but we do not feel it and we do not empathize with Travis Bickle. Scorsese wants us focused on what he did and why we may be tempted to exalt his dangerous vigilantism. So rather than being about Travis Bickle, Taxi Driver is about how we respond to violence. You Were Never Really Here is about how the violent respond to violence. Ramsay inverts the concepts Scorsese offers. Rather than focusing on the violent process, as Scorsese does, Ramsay centers the violent person and violent results. The actual violent acts are often not depicted at all. When they are, it’s from a distance or mediated via a CCTV feed or a shattered mirror. Instead, we see the aftermath, the blood, the dying gasping for breath. We do not see guys getting blown away in some firefight. For instance, near the end of the second act, Joe is tracking two enemies in his home. He catches them unawares and shoots them both, but we do not actually see them die. Instead, Ramsay keeps her camera on Phoenix. We see him fire. We see his expression change from focus, to surprise and to stunned relief. We hear the bodies hit the floor. Only then does she turn her camera to the aftermath of Joe’s violent act. There is no shot of the bullet striking the body or the body hitting the floor. Through this technique, which repeats throughout the film, Ramsay removes the “coolness” of her action sequences. We are left with only the brutality and the gradual hollowing out of our protagonist. The only clear violent acts we see are when metaphor is literalized. Joe is depressed, suicidal and suffering from PTSD. Throughout the film Ramsay offers us flashbacks into Joe’s traumatic childhood – hiding in the closet as his parents fight. The action, again, always just out of view, leaving us to imagine what is being done, just as the child would have to. The only clearly presented acts of violence in the film are those that Joe imagines inflicting on himself. He fantasizes about diving into a lake, his pockets weighed down with rocks. He casually shoots himself in the head in a crowded diner, blood spraying and dripping from the table, as everyone around him continues eating their meals. Then we cut back to reality, the world still oblivious to Joe’s anguish. In this way, Ramsay makes physical the concept that depression is violence and rage internalized. And once we realize this, her refusal to depict the real-world violent acts makes perfect sense. Because she’s not remaking Travis Bickle. This isn’t about the social response to violence. This is personal. She’s concerned with the myriad of ways the world’s relentless brutality oozes into our self-identity and self-perception. Even when the violence is just or necessary or an act of self-preservation, it poisons us. It is an unnatural state. In the scene described above, after Joe shoots his home invaders, one has barely survived. He crawls across the floor in a growing pool of his own blood and viscera before lying down on the kitchen floor. Joe interrogates him briefly before joining him on the floor. With each man lying on his back they hold hands and sing along together with the song on the radio, the actor and the acted upon. Violence as a means of asserting dominance and control collapses on itself. Both men are reduced and broken, one physically and one psychically. Vengeance becomes trivialized and small. Joe’s greatest outward display of sorrow comes, neither when he discovers the young girl he is trying to protect, Nina, has been kidnapped and likely raped nor even come when he learns that his mother has been killed, but rather when he realizes Nina had to execute her violent acts personally. She has blood on her hands. She was successful and unharmed but at that moment we see Joe truly break down, sobbing, tearing his clothing off because he knows the trauma he has carried will now be visited upon a child. And he knows that Nina has performed for him a great act of mercy, saving him from having to carve out a little more of himself to kill yet another human being. She gives him grace, unearned and freely bestowed salvation. Films hinge so much on small choices – sound mixing, lighting, when to cut. Ramsay, presented with a script that is admittedly quite similar to Taxi Driver, drastically changes the messaging and meaning through minor decisions like choosing not to cut to the action or placing the camera further away than you’d expect. This seemingly minor stylistic decision creates ripples that color the entire psychology and philosophy of the film. We should learn from this. Comparisons are fun and provide context, but we should also note differences and what functions those differences serve. Films are series of choices and every choice matters.